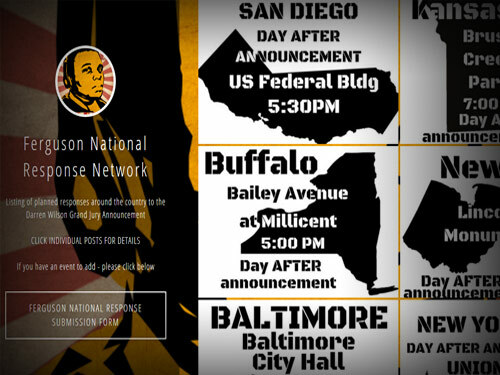 A Tumblr page for something called the “Ferguson National Response Network” has posted a very organized list with graphics for each location (which must have taken a lot of time and effort) detailing these “planned responses” that have been scheduled for a total of 82 cities across the U.S. and one in Canada after the grand jury announces their decision (something which, if it’s as scripted as the rest of this situation has been and continues to be, will be expertly timed with the holidays coming up). Wow. Just wow. This is not your average civil disobedience. Martha Stewart has thrown less organized birthday parties than this. There are White House functions with less planning and training involved. Anyone else get the sense that this whole thing has been co-opted? Think about it. When you’re mad about something that’s wrong with the system, what do you do if you want to protest it? You pull out a black marker, get a poster board, call up your friends, maybe send out a few Tweets or Facebook messages, then you find a corner and start protesting. You don’t get so angry with the system that you first a) write a proposed rules of engagement list, b) start fundraising campaigns, c) set up highly coordinated protests in 83 cities, d) coordinate mass informational meetings and finally e) hold direct action trainings then get ready to protest. What average, random person has the time and money to pull off all that off properly? Sure people have been protesting this for months now, but still. What monster has Ferguson now mutated into? Who is ultimately behind it, driving the agenda? 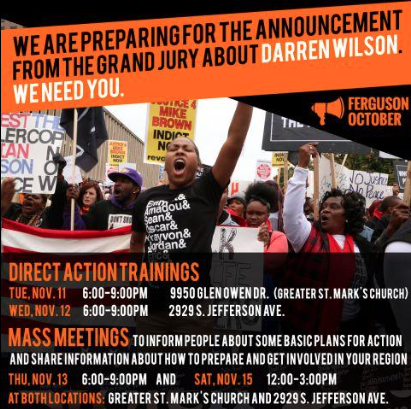 Many of the people who showed up to protest in Ferguson from the beginning were coming from out of town. There were definite provocateurs among the crowds trying to incite violence. At this point, people are apparently quitting their jobs and flocking to Ferguson to devote all their time and energy to this. On the same day as the WP article came out, The Daily Sheeple published an article about the fact that cops kill an average of THREE PEOPLE EVERY DAY in this country. UPDATE: Curiously, Obama has announced that he’s going to be in Las Vegas on Friday (when the media has hinted the grand jury decision might come) after he announces his amnesty decision. Las Vegas is, ever so coincidentally, not on this list…in fact, Nevada isn’t even on this list, period.